a little story. a lot of hope. Children’s books have very confusing messages about animals. Farm animals are perhaps pictured in the most problematic way—shown in pairs (usually mother and child) or as small nuclear families, living in peace on a spacious farm. It would never occur to the average child that a cow in a picture book is the same animal as the hamburger s/he ate for dinner. Nor would most children be able to comprehend the actual “farms” most chickens live on if all they ever learned of a chicken came from a storybook. These stories create a confusing terrain for children: they are told that animals are lovable and live much like humans, at the same time they are fed animals to eat and taken to zoos and circuses where animals are used as entertainment. It is easy for a child not to question such contradictions since their books and movies allow them to a believe that animals are happy in their service to humans. Children are not taken seriously enough to be told the truth about the lives of the animals that they eat or watch or wear. That was until Ruby Roth came on the scene. When I first heard about Roth’s book, That’s Why We Don’t Eat Animals, my heart skipped a beat. 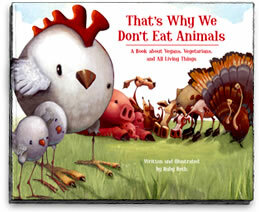 It’s a storybook for children explaining plainly how animals like to live, how they actually live and how we should treat them. I wondered if Roth could actually pull it off. I avoided looking at the book for some time because I assumed disappointment was inevitable. I was wrong. Pigs need the sight, sound and touch of one another. Sometimes they snuggle so close that its hard to get them apart. Love is part of their nature. Drawings and descriptions of how animals want to live their lives juxtapose drawings and descriptions of how animals on factory farms, in the oceans and the rainforests are actually forced to live their lives. Roth treats the reader with respect, giving frank descriptions that are to-the-point, void of rhetoric and honest. She effortlessly moves through issues like factory farming, pollution and extinction–topics that are even difficult for adults to grasp. It is a simply written and beautifully illustrated book that introduces children to the most basic of facts about animals’ lives and the impact that humans’ decisions can have. Definitely a must read! You can buy it on Roth’s website.